The 2016 Slifka Center Alternative Spring Break Trip will be from March 13-20 and will be in the Mississippi Delta region. 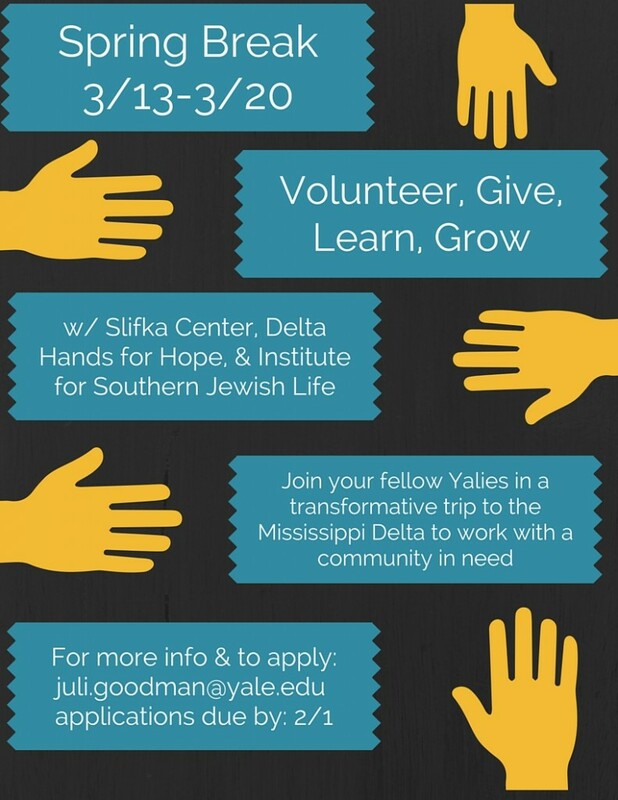 We will be working most closely with the organization Delta Hands for Hope (http://www.deltahandsforhope.org) and exploring Southern Jewish life with the Institute for Southern Jewish Life (www.isjl.org). The focus of this trip will be on various issues (education/education policy, food insecurities, etc.) and how they effect this community, which we will examine by working in partnership with organizations in the area, meeting with community leaders, and exploring the rich culture of the region. The cost of this program is $200 per participant which includes, flight, accommodations (in a church parsonage), & food (food provided will be vegetarian, but not necessarily certified kosher). The cost of this program is not meant to be prohibitive of anyone’s participation.